When I come home from work at the end of the day, I am so excited to hear how my daughter's day was at school. I have learned that to ask the common question "How was school?" or "What did you do?" usually results in a generic response of "Good" or "I don't know." I had to rephrase my questions to get some conversation going. So I started to ask my daughter questions like, "What happened today after 1st recess?" This gave her a point in time during the day for her to recall and low and behold, we were having a never ending conversation about her day and interactions she'd had with friends and teachers. 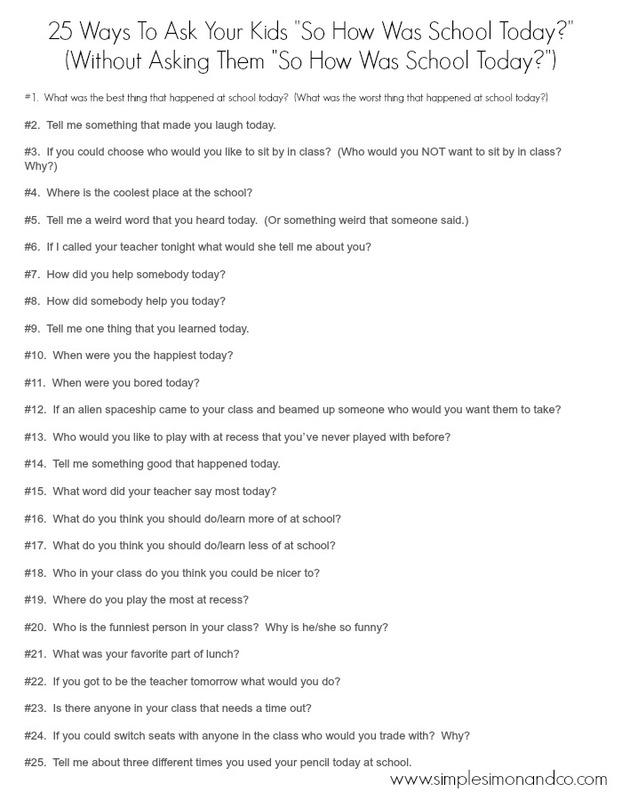 I recently came across this printable tip sheet called 25 Ways to Ask Your Child "So, How Was School Today?" . These questions are great conversation starters, and you can pick and choose what questions to ask that are right for your child. Give it a try and I'm sure you will find out more than you ever thought you would know about your child's day at school.